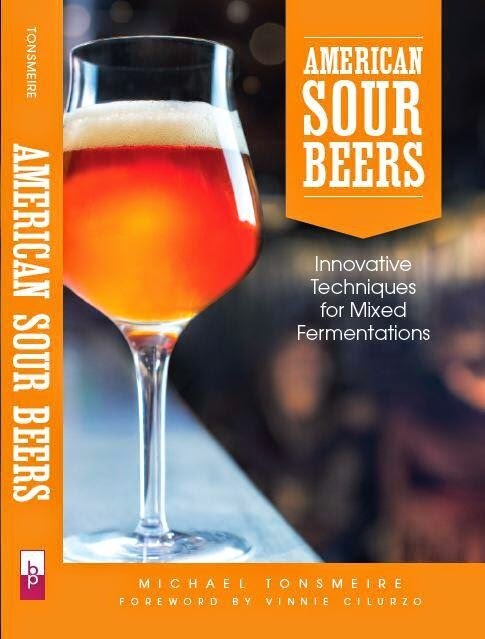 My friend Nathan and I are in the midst of writing an article on kvass for an upcoming issue of BYO. A few weeks ago we brewed a "standard" batch based on the recipe we helped brew at East End Brewing in Pittsburgh back in July. I had brewed two similar batches of kvass a couple years back, but this time we had Scott's actual recipe and we used a loaf of my no-knead rye bread instead of store bought. Unsatisfied to mimic East End, we also wanted to put our own twist on things by brewing a couple of additional batches. In preparation, on Tuesday night I baked two loaves of pumpernickel bread that will be going into the experimental batches we are brewing tomorrow night (one soured, one gruit-style). 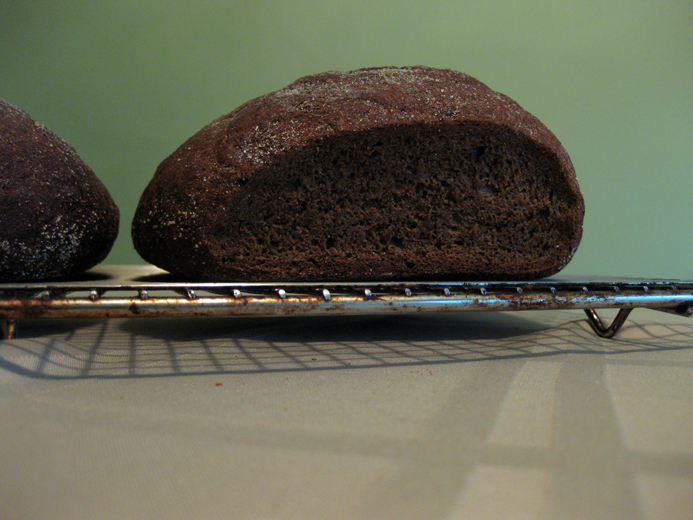 I did quite a bit of research on pumpernickel while trying to figure out how I wanted to make the bread. The recipes I found seemed to fall into two distinct categories, complex German (with traditional old-world techniques like adding soaked toasted bread crumbs from a previous batch, multiple long slow rises etc...) and simple American (with odd ingredients like instant espresso, cocoa powder, and caramel coloring). I needed a recipe I could make in a single night (so not enough time for a slow rise with my sourdough starter), but I didn't want to get the color from something that would impart an out of place flavor. My imagination was sparked by a post on The Fresh Loaf that suggested adding a small amount of chocolate wheat malt to boost the color of the pumpernickel. I didn't have any chocolate wheat on hand, but I did have some Carafa Special II (left over from a Smoked Baltic Porter), so I put a small amount into my coffee grinder and let it run until it reduced the malt to a fine powder. In addition to the Carafa "flour", I added whole rye flour, along with bread flour to ensure a good rise. For additional color I added some molasses, which seems to be a somewhat standard ingredient in the recipes I saw (although I'm not sure how common it is in Germany). I used a packet of bread yeast for two loaves, along with some actual kneading to bring the dough together to develop some gluten. The rest of the procedure was pretty close to my usual no-knead loaf production, baking in my cast iron Dutch oven with the lid on to start, then removing it at the end to allow the crust to crisp. The finished bread was pretty tasty, with some full city tones and a nice rich cocoa color without adding either coffee or chocolate. 1. Sprinkle the yeast onto the ~100 degree water and let sit for 5 minutes to rehydrate. 2. Mix the dry ingredients together with a whisk. 5. Once a dough is formed turn it out onto a floured work surface and give it a few kneads to ensure that there are is no dry flour. 6. At this point the dough will be very sticky, so cover it with a towel and leave it alone for a 10-15 minute rest. During this time the starch will hydrate and the proteins will align; when you return the dough will be much easier to work with. 8. After 90-120 minutes the dough should be double its original size, and ready to shape. 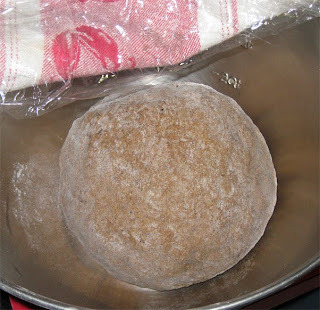 Fold the dough over a few times to distribute any large pockets of CO2, and roll it in a circle between your hands to form it into a round loaf. Place the loaf on a tea towel with cornmeal or flour to prevent it from sticking. 9. Leave it to double in size again (about 60 minutes). 10. Place a cast iron Dutch oven in a cold oven and heat to 425 (450 for an enameled cast iron), this should take 25-30 minutes. Once the pan is heated slash the top of the loaf with a sharp knife or razor a few times and place it into the pot, return the lid, and place the pot in the oven. 11. After 25 minutes remove the lid and boost the oven temperature 25 degrees to finish browning. 12. When the loaf is nicely browned remove it to a cooling rack, and try to give it 15 minutes to cool before slicing into it. Coincidentally, I just brewed a test batch of a pumpernickel porter recipe that's been floating around my head. 50% MO and 30% rye malt with 5% each of munich, lt chocolate, special roast and special b. Was going to add caraway after fermentation slows but maybe I'll go with some molasses as well. that bread looks very good. I wrote it down in English for a friend. Thanks, I'll have to give that bread recipe a try. Nice work on your Pumpernickel Porter by the way, I really enjoyed the bottle I had a few months back. 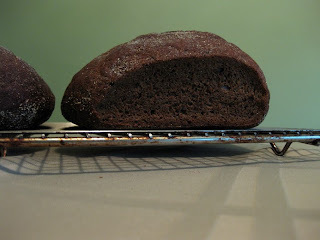 Michael I backed this recipe and I think it is the best pumpernickel I have made to date. I pick up many notes of roasted grain and chocolate. I am going to use this to make a kvass. Cheers! Glad you enjoyed the bread, and good luck on the kvass.